The present group works mainly in the forest remnant on relatively steep slopes on the northern side of Schultz Canal in Kalinga Park. (See UBD Map 140 ref. J3). The conventional entry to the ample children's playground, large picnic area and dogs-off-leash area at Kalinga Park is from the south via Park Av., Eagle Junction. Access from the south to the northern section is via two footbridges served by Greenway bike and pedestrian pathways. Roadway access from the north is from Carew St., Hamson Tce. or Toombul Tce. Kedron Brook becomes Schultz Canal just after the brook flows by Shaw Park into Kalinga Park. During the depression after the Second World War, this canal was used to divert all water flow from the brook into what was then the Serpentine Creek system. This system, in turn, was altered radically when the Kedron Brook Floodway was constructed in the mid-1980s to accommodate Brisbane's airport. Early development of the area increased during the 1960s and 1970s. At one time, coal was mined from a cliff site within the present bushcare group area. This coal was used for a short time as fuel for the community and industry of developing Brisbane. In 1910, local councillors were brave (or farsighted) enough to purchase and set aside the present area of Kalinga Park, hence the recent Centenary Celebration eventually held on 13 November 2010. The riparian canopy vegetation contains Waterhousia floribunda, Coral tree (Erythrina sp.) and Chinese celtis. Over time, it became obvious that weed control and understorey planting or seeding was urgently needed to increase native plant components in the Kalinga Park remnant. It became important that a Bushcare group be formed to identify, protect and enhance this habitat. 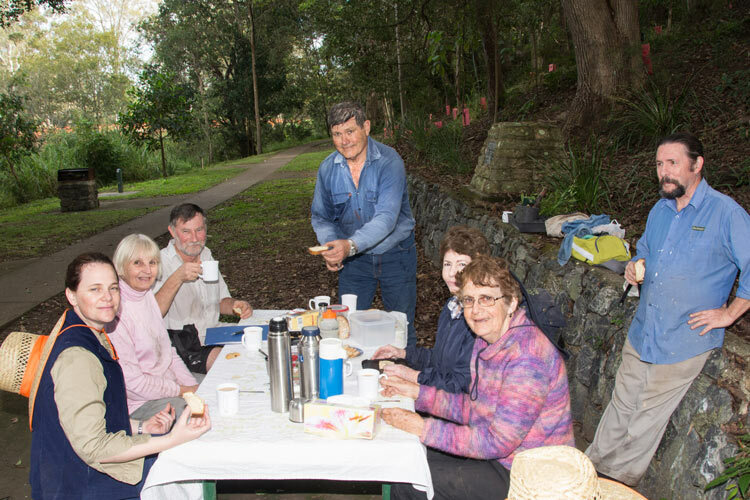 The first bushcare group became active in the 1990's but after initial successes, the group gradually faded away over the next ten years or so. In 2009, funding became available for the Kalinga Park Restoration Project on the northern side of the Brook. The present group was formed as a consequence of the success of this project. Steep hills adjacent to the northern bank of Kedron Brook support a Eucalypt open forest that has probably regenerated since settlement. The forest understorey in this area is sparse and weedy. Ground hollows are associated with steep banks and rocky outcrops. Eastern water dragons are abundant and are frequently seen sunning themselves on the Creek bank. A significant piece of the eastern end of Kalinga Park has been taken back, initially to accommodate the construction works for, but finally the emergence of, the Airport Link vehicle tunnel from Bowen Hills to the Airport. The Northern Busway construction has also contributed to this reduction of parkland asset. Parkland with mature paperbark and eucalypts on the southern bank contains trees with potential nesting hollows for wildlife. Rainbow lorikeets and Scaly-breasted lorikeets nest in hollows in tall trees. Important remnants of littoral riparian vegetation are found in lower reaches of this parkland. This area is another important link in the Mountains to Mangroves Corridor, particularly because of the forest remnant distributed mainly along the northern bank of the Brook at this site. There are also a number of large eucalypts on the southern side of the brook that have useful hollows and provide nectar for birds and marsupials through the year. Being well down the catchment, the brook has continuous water flow most years at this site. The steep gradient on the northern slopes poses a concern in regards to issues of erosion and accessibility for habitat restoration and maintenance. Much of the work done at the site to date has required an experienced contractor to use methods that ensured slope stability and reduced erosion. This reduced the sediment load to the Brook, and eventually Moreton Bay. While the remnant vegetation at the site is very heavily infested with a range of weeds, of particular note, there are large woody weeds (chinese elm/celtis and camphor laurel) and weed vines (cats claw, balloon vine, and madiera vine). It also has significant old growth canopy species such as weeping lillipilly, Eucalyptus sp. and some native black bean trees. With the large scale removal of lower and mid-story weeds, the degraded nature of native under-story species became more apparent. In the past this site was used as a landfill site. Hence, much of the site has a poor soil profile. In some areas the top soil layer is so shallow that it is possible to see the large items that were previously dumped at the site. Such poor soil quality has had many implications for establishing new vegetation. 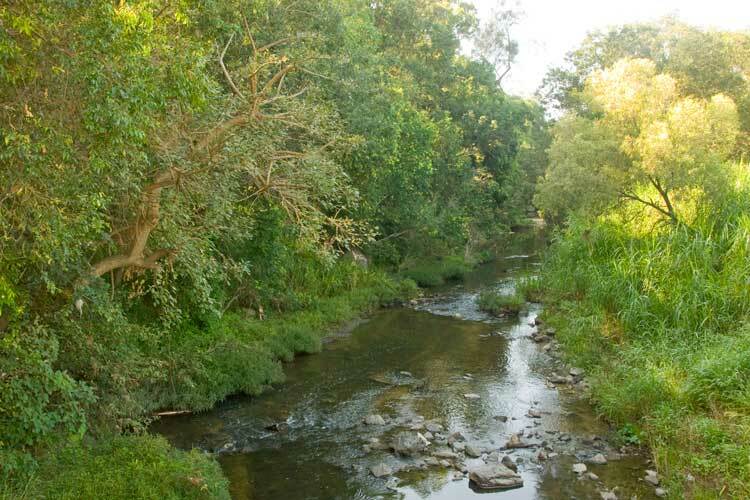 Late in 2008, the Kedron Brook Catchment Branch was awarded a grant to undertake a habitat restoration project on the northern banks of Kedron Brook in Kalinga Park . This project was made possible through funding from the Australian Governments Caring for Our Country. 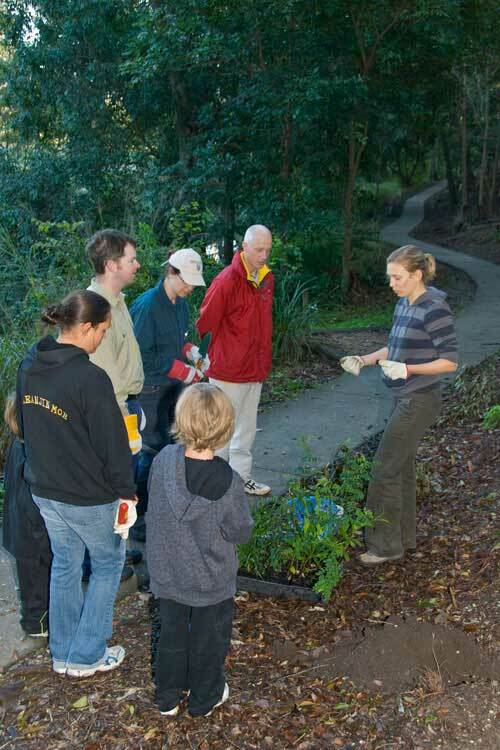 The original impetus for this project was a weed “blitz” undertaken by Brisbane City Council following safety concerns in this stretch of the Kedron Brook bikeway and pathway network. After the weeds had been removed, it revealed just how much of this bushland was weed infested and also the steep gradient of much of the slopes. In late June 2009, all local residents were invited to attend the Kalinga Consultation Workshop and a stable group consequently became involved in planning the works at the site. Contractor work started, first in tackling the chinese elms/celtis on the steep slope along side the stairs on Carew Street. 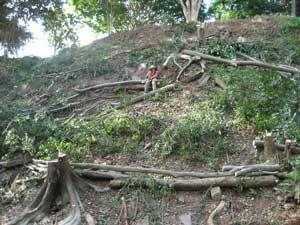 Initially this involved chopping the chinese elms down without killing them to utilise their root systems for ongoing slope stabilisation. Where appropriate branches were retained onsite and in conjunction with the installation of coir logs, were used to further provide bank stabilisation and erosion control. In addition to this specialist work, the contractor, David Colbert, carried out extensive work throughout the 8520m2 site treating and removing at least twenty weed species of concern. Opportunities for natural regeneration are limited due to the degraded nature of the site. Therefore, revegetation was undertaken by David in several "pockets" where it has been determined that re-introduction of endemic native plants would enhance the restoration of the site. After that first consultation, five working bees were held at the site in "pockets" selected for community attention. 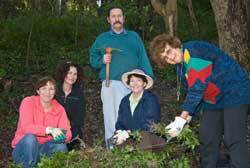 In October 2009, Cr Kim Flessor attended the first of these working bees to provide his support for the work being undertaken and lend a hand to plant some natives. Each working bee has had a main focus of either planting or weeding. 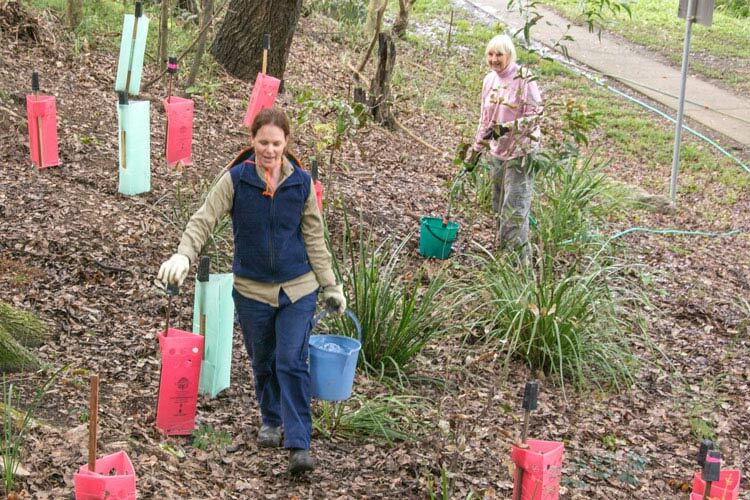 The community volunteers have contributed an amazing effort to the restoration project, spending approximately 150 hours (combined) planting over 300 plants and removing approximately 1.5 tonnes of weeds from an area of 1350m2. The Kalinga Park Restoration Project ended by September 2010. However, Kedron Brook Catchment Branch and their Creek Ranger, Anna Bourke, were determined not to let the good work undertaken at the site fall by the way side. 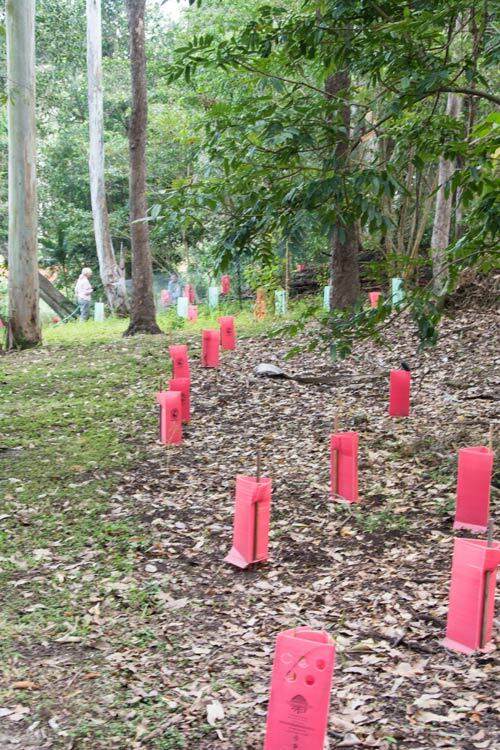 Therefore, they have ensured that, in the absence of further funding, there will be maintenance of the weeds through Brisbane City Council's Wipe Out Weeds program. Further more, the Kalinga Park Bushcare Group officially were accepted as part of the Habitat Brisbane program in September 2010. They had their inaugural meeting in February 2011. A selection of a few images taken in the Kalinga Park Group area near Toombul Tce. 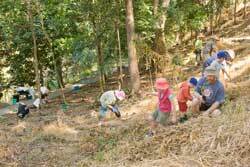 Kalinga Park Bushcare Group holds its bushcare activities on the 3rd Saturday of the month. During the summer period, start time is 7.00 am with finish at 9.00 am. Activities usually start close to the picnic table situated at the Kalinga Park Coal Mine Memorial plaque. Street parking is conveniently available in Hamson Terrace. Follow the walking track into the park upstream from Hamson Terrace.